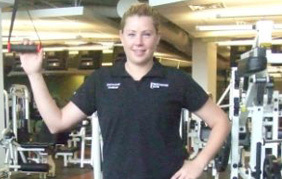 Erin is our Personal Training Manager at the New Berlin location and been a trainer here since 2004. She is a graduate of UW-Parkside with a Bachelor of Science in Sport and Fitness Management, with Certificates in Wellness and Coaching. She is a Certified Personal Trainer, Certified Endurance Trainer, and has a Certification in Fitness Therapy through ISSA (International Sports Science Association). She is also Spin and Yoga certified. Erin is a competitive athlete and participated in varsity basketball and soccer in high school and went on to play Varsity Soccer at UW-Parkside where the team became the 2003 Conference Champions for the first time in school history. After graduating, Erin became involved in running marathons, including running the Boston Marathon in 2008. Erin currently is the Head Girl’s Soccer Coach and Boy’s Varsity Assistant Coach at New Berlin Eisenhower where she enjoys working with kids. At the club, she likes doing sports specific training, marathon and triathlon training, working with people post-rehabilitation, as well as training for general health and fitness. Erin is available for one-on-one training and small group graining. Erin directs the Personal Training Department at the New Berlin club and is available to answer general questions on personal training as well as assist people in finding the best training type and trainer for their needs. Erin an be contacted at 414-525-2383 orefrantz@princetonclub.net.